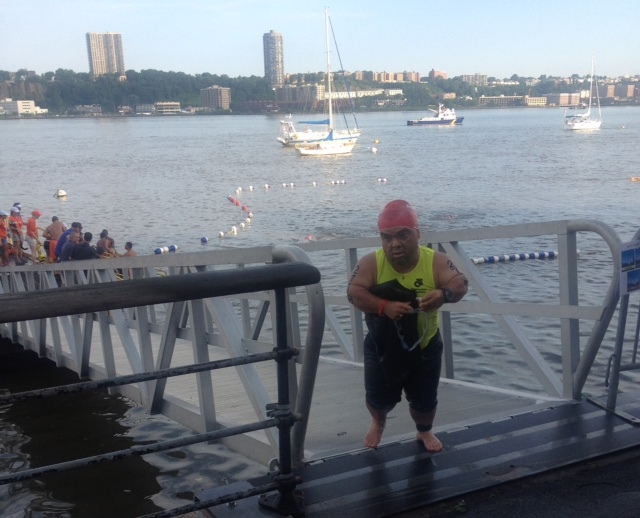 As far as I know, I am the only dwarf who has completed a triathlon. Maybe I’m not, but at least I have never been able to find another like-minded little person (LP). In the recent months I have had two members of the LP community contact me stating that they are training to complete their first triathlons later this summer. This past July I returned to NYC to race in the NYC Triathlon. As a new member of Achilles International, I race with other physically challenged athletes on the same course with able-bodied age group athletes and pros as well. The race itself was a challenge as most triathlons are. It includes a 0.9-mile swim in the Hudson River, a 26-mile cycle up and down the West Side Highway and then a 6-mile run up 72nd Street into and around Central Park. I had a terrific day on the course as the fan support in NYC is amazing.